True enough… but there is more to beauty than meets the eye. What one person may think of the layout, color selection, graphics, or feel of a website, is often completely opposite of what another thinks. Generally speaking, web designers typically try to appeal to the customer’s notion of what is beautiful. The theory being that the customer is paying the bill, or at least the one responsible for approving the design so that the designer gets paid. It is easy to see the motivation for these designers. Unfortunately what the customer likes may not achieve her goals, or coincide with the purpose of her website. Going back to part one of this series you might remember that the purpose of a website is to create a customer. In subsequent chapters you will also learn that the layout and content of a web page can improve your page ranking with the various search engines. While an attractive design is important… page rankings produce more traffic and if your content is appropriate… more customers. The goal for effective web design is to develop pages that produce results following proven design principles and marketing strategies as well as embracing the evolving technology of the Internet and search engine companies. Too many fonts, colors that clash, and pages overloaded with miscellaneous content, make it difficult to stay on a page long enough to even see what the page is about. Websites that are cluttered work for known entities such as CNN, The Washington Post, MySpace and others, because they are known entities and visitors have an idea of what to expect. 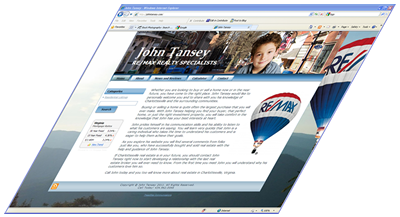 Your business or your website may not be a known entity. Today the most visited websites on the Internet include Google, facebook, and YouTube. While these companies have the benefit of being “known entities” they have embraced the concept of simple sells. Google is a search engine. You go there to search the Internet and that’s the service they provide. They do offer other services available through their menu system but their pages are clean and easy to navigate. Go to facebook.com and it’s pretty obvious what they want you to do. Simple Navigation – Should be a natural flow of expected links. Company Logo – If you are affiliated with a national company, display their logo. Obvious Call to Action – Don’t make the customer think. Aesthetically Pleasing – Uncluttered and simple. We live in a busy time of information overload and you won’t have much time to capture the attention of your web visitor. Keep it simple.